The hosts have pulled off a brilliant comeback. Australia ended their 6-match winless streak in Tests in a grand style. 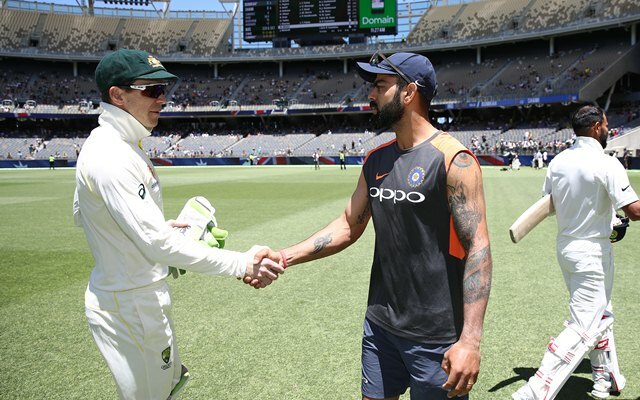 By defeating India in the second Test, the home team levelled the series 1-1 and also won its first game ever under Tim Paine. The visitors were completely outplayed in this Test, dominated throughout and lost the game by a margin of 146 runs. The hosts didn’t take too long to finish things off on the last day. India went in with 112/5 at the start of day’s play. Hanuma Vihari and Rishabh Pant were the last two recognised batsmen who walked straight into the middle. These two youngsters displayed some composure at the start. However, it was only a matter of time before Mitchell Starc dismissed Vihari. The right-hander was rather unfortunate in the way he got out. A top-paced delivery from the pacer nipped back in and got the inside edge of Vihari. The ball hit his thigh pad and took off a long distance for Marcus Harris to complete an easy catch. Rishabh Pant tried to go bonkers after this wicket fell. Yet, he failed to score as many runs as he would like. He went for a hoick against Nathan Lyon but failed to get a proper connection. Peter Handscomb inked the final writing on the wall with an unbelievable catch. He dived to his left to take the catch as the ball was dipping on him. After Pant got out for 30, it didn’t take too long for the Australians to wrap the tail up. Mitchell Starc cleaned up Umesh Yadav with a caught and bowled right in the next over. Then Pat Cummins finished off the proceedings in the over after that with a double blow to bowl India out. Both Ishant Sharma and Jasprit Bumrah were dismissed for a duck. Lyon, for his 8-wicket haul in the match, was adjudged the Man of the Match.